Pacific Bend Inc. provides pick modules. Pick modules are designed pallet rack systems that feature different storage resolutions inside multi-level work platforms that move products around very efficiently throughout a distribution facility. Pick Modules are composed of pallet rack, shelving, carton flow rack and pallet flow systems in order to store inventory for picking and order fulfillment. Pick Modules allow companies to fulfill thousands of orders per day or process millions of units in a week. Pick Modules use pallet racks to support the miles of conveyors and product flow systems, thus decreasing congestion and expensive pick mistakes. In a multi-level environment, pick modules are large and compound structures which aid the storage and retrieval of loads. 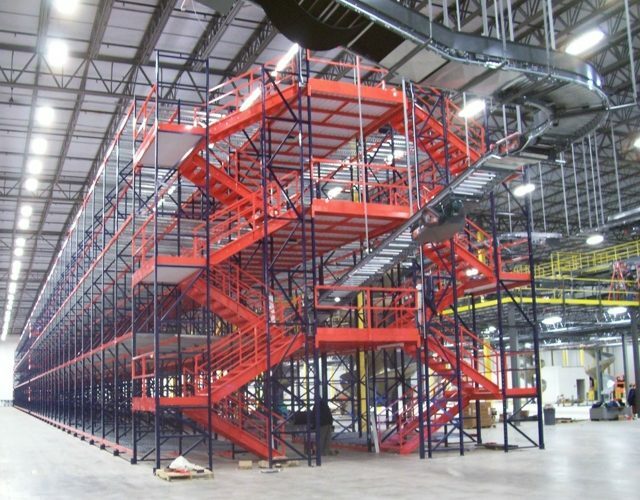 Typical for large distribution centers, combined with basic pallet rack components, such as uprights and beams, and other components that facilitate the movement of products and inventory control. The thought behind the Pick Module is to optimize flow efficiency of products. Palletized loads are moved by gravity through the system before being broken down into pieces, then sent to pick areas and finally shipped to the consumer. Integrated conveyor and sortation systems along with technology, guides the flow of inbound materials and products through the order implementation stage. Please provide any details about your requirements. We ask that you fill out our quick, 30-second form. Our team of material handling experts will contact you as soon as possible with our free estimate of needed material and services.